WesLor Enterprises, Inc. is a manufacturer of many products, specializing in steel, aluminum & stainless steel fabrication. 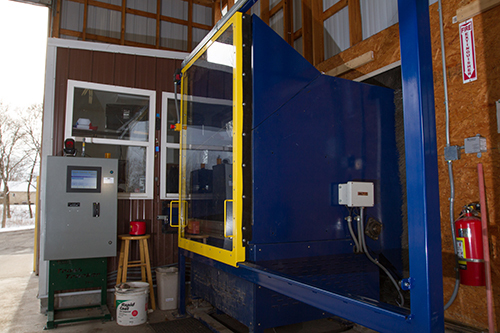 WesLor offers Powder Coating, integration, and manufacturing of custom trash and recycling solutions. Our Trash Tracker system takes the guesswork out of waste handling; automating the collection of fees and data for trash disposal and recyclables recovery. This provides accurate accounting & data collection for all required reporting and solid waste management planning. The Trash Tracker consists of a custom, interactive console with revisable software, and custom trash and recyclables receptacles and scales. The console software is customized based on the waste types you want to track, with a fee (or no fee) and unit of measure (unit or weight) for each waste type. Receptacles and scales can be designed and built for any size or type of waste, and for any type of location or use such as transfer stations, apartments / multiple dwellings, shopping centers, drop-off centers, or other custom solutions. Custom retrofits necessary to accomodate the Trash Tracker console and receptacles, and to facilitate simple handling of trash and recyclables such as compactors, dumpsters/bins, flat scales, ramps, conveyors, buildings, grading, etc., can also be included in the system design and construction. The interactive console can serve as diversion assistance by indicating which types of waste are recyclable and which receptacle to use for each waste type, resulting in better quality recyclables collection. Users are incented to recycle more and recyclables quality is improved as clean recyclables have no or less fees than trash or contaminated recyclables. The software is customized to meet your needs for PAYT billing and tracking / reporting of waste types, amounts, and fees collected, units of measure, etc., and can be changed by the owner as markets, recycling requirements, etc. change. Real-time data is integratable with other data systems and reports are customized based on your needs, allowing for efficient hauling, accounting, and fiscal / SWM planning. The re-loadable swipe card unlocks the receptacle, preventing unauthorized use and can be easily loaded with annual municipal allotments.